"Kings County is located in central Nova Scotia on the shore of the Bay of Fundy with its northeastern part also forming the western shore of the Minas Basin. The part of the county residing in the Annapolis Valley comprises the agricultural heartland of the province and boasts over 600 farms; the area is famous for its fruit crops, primarily apples. As with most coastal parts of the Maritimes, Kings County's shoreline was home to a productive shipbuilding industry during the 1800s. Wolfville houses the highly ranked Acadia University. Cape Blomidon and the North Mountain preside over the Annapolis Valley, whereas the South Mountain and interior forests to the southern part of the county support a variety of lakes and recreational cottaging areas. The Municipality of the County of Kings has area of 2,122 sq.km. and population of 60,000." 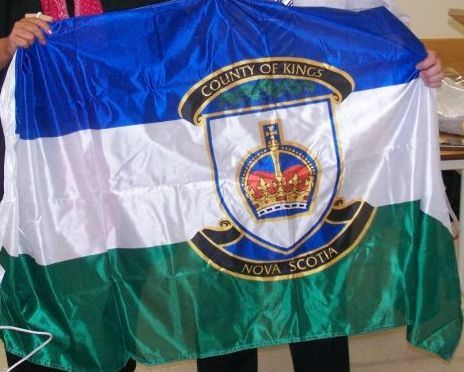 The flag of the Kings county has three horizontal stripes of blue-white-green and county coat of arms in the middle of the flag, as can be seen on a photo here: http://www.novanewsnow.com/article-337964-Kingston-AGM-packs-em-in.html. Click for larger image.